Available in many sizes and styles and constructed in carbon steel, 304 stainless steel, or 316 stainless steel. Knight Housings / Vessels serve as bag filters or basket strainers. 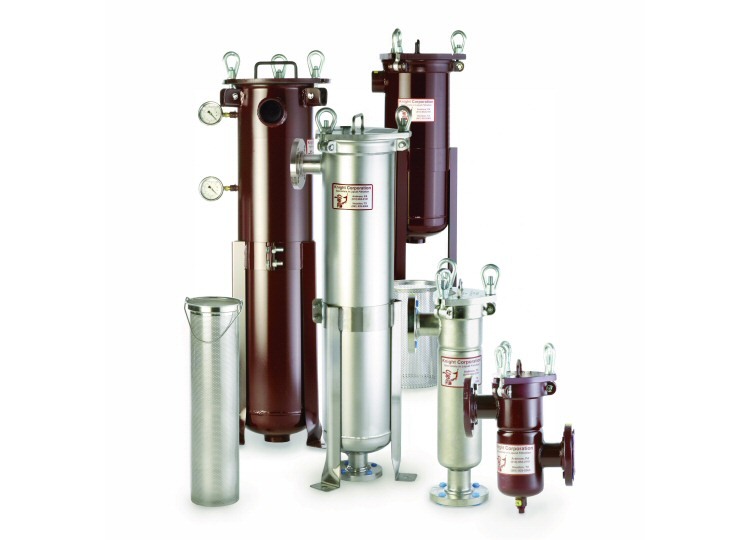 Bag Housings are sometimes called filter vessels. They are top loading with a hinged or threaded lid. A perforated restrainer basket fits inside the shell to support the filter bag under pressure. The plastic ring at the top of the filter bag snaps into a precision groove inside the housing, providing a positive seal to prevent bypass. The lid is sealed by a gasket which is typically nitrile (buna) or fluorocarbon (Viton�) rubber depending on your product’s temperature and chemistry. The surface area of the filter bag determines the quantity of contaminants it can capture before it is used up. The pressure drop across the bag will increase when it reached the end of it’s life. Each housing has a 1/4 inch NPT port in the lid for a pressure gauge.